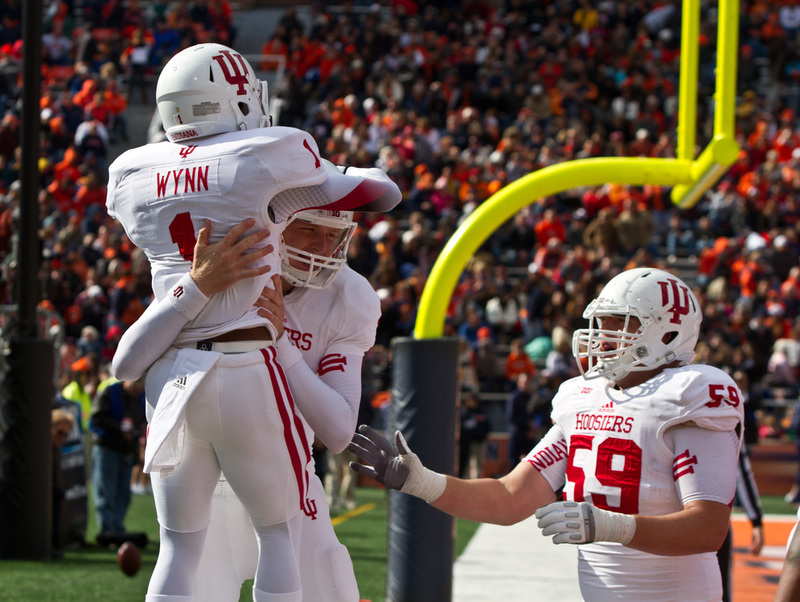 The Hoosiers hope for more celebrations in 2013. Last week we continued our look ahead at the 2013 season by asking the first set of questions regarding the Hoosiers entering the season. Today we will be taking a look at the five most pressing questions hovering over the program as camp opens up. 5. Will all of those yards on offense actually lead to points on the board in 2013? We all know that Indiana has had a dynamic offense; it has been the case for quite some time. Even before the days of Kevin Wilson roaming the sidelines the Hoosiers had no trouble moving the ball up and down the field. However, last year there was a big problem…Points! In 2012 Indiana put up a gaudy 442 yards of total offense per game. That number placed the Hoosiers second in the Big Ten Conference, and 19th nationally amongst BCS level schools. The passing game was even more dynamic, as Indiana threw for 311.2 yards per contest. That number was not only good enough to lead the Big Ten, but it also placed the Hoosiers amongst the top ten BCS teams in the nation. The issue however, is that yards do not show up where it counts on the scoreboard, and they sure do not matter when it comes to determining who wins and losses ball games. As you may already know from your years of football viewership, it’s the team with the most points at the end of the game that is victorious. The Hoosiers had trouble turning that explosive offensive performance into points last year, averaging just 30.8 points per game. While it did place them a respectable fourth in the conference, the eighth place team, Purdue, averaged just two points less per contest. Nationally Indiana ranked just 52nd when it came to points scored. This is something that has obviously dawned on the coaching staff as Coach Wilson has discussed it during his time with the media before camp started. There are some ways for the Hoosiers to take the next step when it comes to putting points on the board. First and foremost Indiana needs to do a better job of converting on third down. Last year they converted just under 37-percent of their opportunities to move the sticks on third down. A less obvious area for improvement would be penalties on first down. They move a team off schedule and kill any momentum a drive had. There is nothing exciting about 1st and 15 or 20. Last year Indiana had the second most such penalties in the conference behind Nebraska who lead the conference with 86 penalties. The final answer to this question is the personnel. Sure it is fun to throw the ball around the lot, but sometimes it needs to be reigned in. Talents like Stephen Houston and Ted Bolser should not be wasted in the red zone, and should be relied upon heavily. 4. Who will step in to fill the spots vacated by the injured Chase Hoobler? The Hoosiers have received a bunch of bad news over the last week or so. From recruits not meeting academic standards, to players being booted off the team, it was an ugly couple of days. The most disheartening of the news was when word broke that linebacker Chase Hoobler would be lost for the season. This is nothing new for Hoobler who missed half of the 2012 season with an injury to his ankle. During his redshirt freshman season, his lone full year of play at Indiana, Hoobler recorded 48 tackles including five tackles for loss and two sacks in 12 games while making eight starts at the outside linebacker position. Luckly for the Hoosiers, depth has been built up at the linebacker position through recruiting and dipping into the junior college ranks. Steve Funderburk should be the player to watch out for when it comes to replacing Hoobler. The Florida native was a member of the Iowa Western Community College who won the national championship last season. The 6-foot-2, 225 outside linebacker made a name for himself last season racking up 49 tackles including 7.5 for loss, recovered a fumble, and took both of his interceptions back for touchdowns. If Funderburk can bring even some of that big play ability with him to Bloomington, he will be a sight for sore eyes as a replacement for Hoobler. 3. Which receiver will have the biggest statistical year? This very well may be the most fun question of the group. As we have touched on, the Hoosiers like to throw the football. The passing game was absolutely explosive last season as Indiana threw for 311.2 yards per contest. That was good enough to lead the Big Ten and place them in the top-ten nationally. The offensive unit has ten returning starters that have all gone through spring camp, offseason workouts and are heading into fall camp together. Offensive coordinator Seth Littrell has another year to become even better acquainted with his weapons that should allow for even more dynamism and versatility. When it comes to who will have the biggest year hauling in passes for the Hoosiers in 2013, it comes down to two players really. A pair of Ohio natives entering their junior season, Cody Latimer and Shane Wynn comprise the duo. However, physically the two could not be more different. Latimer is a traditional number-one receiver type standing at 6-foot-3 215 pound. Last year was his coming out party as he hauled in 51 receptions for 805 yards and 6 touchdowns. Wynn on the other hand is a diminutive slot receiver at 5-foot-7 inches and just 167 pounds. That didn’t stop him from joining Latimer in the spotlight last season as he racked up 68 receptions for 660 yards and 6 touchdowns. The question remains, as to which of these players will lead the Hoosiers statistically in 2013. It would be easy to say that Latimer will be the main man as even with 17 less receptions he blew Wynn away as far as yardage goes. However, I fully believe that Wynn will be passing the kick return duties onto a younger player this year allowing him to spend more time and energy on the offensive side of the ball. While I think that both players will improve their numbers, that combination, mixed with an extra big play or two will put Shane Wynn over the top statistically in 2013. 2. Who will be taking snaps under center for the Hoosiers in week one? After number three, this very well may be the least exciting question of the ten. Sure it is probably the most important of them all, however, it has been bandied about since the last second expired in the Bucket Game. There has not been a Hoosier fan that I have encountered who doesn’t have both a strong opinion on the matter as well as a signal caller that they are rooting for. However, if you truly take an honest, nonbiased look at the three candidates, none of them have a true case as to why he should be the guy. The obvious pick is Tre Roberson. The sophomore was a total stud during his six quarters of action last year before going down with a knee injury. Six quarters that has been incessantly tickling the imaginations of Hoosier fans for the last year. Roberson is a dual-threat quarterback who in his freshman year displayed an arm that needed work to go along with legs that wouldn’t quit, basically par for the course when it concerns young dual-threat kids. The safe pick would be Cameron Coffman. Coffman was a junior college transfer who was looking at a lot of time on the pine last year that was until Roberson went down. Coffman filled in valiantly and was able to put together a relatively impressive campaign. He completed 60-percent of his passes for 2,734 yards and 15 touchdowns. Coffman has the experience, the health, and the arm to lead this offense. The long shot selection would be Nate Sudfeld. Sudfeld saw action in seven games last season, however he threw the ball just 82 times. When he did toss it, he was efficient as the California native completed over 62-percent of his passes while throwing seven touchdowns compared to just one interception. While he is the least experienced of the trio competing for the starting spot, he is the one that is most built in the mold of a prototypical pocket passer, standing at 6-foot-5 and 234 pounds. I think like most Hoosier fans, the coaching staff wants to see Roberson come out and shake off the rust in fall camp and take control of the job. His ability to use both his arm and legs would add just another dimension to an offense that was already dynamic without it last season. I believe that in their heart of hearts the coaching staff looks at Cam Coffman as plan B. Not that he would be a bad way to go, in fact he may bring attributes to the table that Roberson can not, but not what they are hoping to happen. While Coffman put up some solid numbers last season, it made his share of mistakes as well. Most egregious was his 15:11 touchdown to interception ratio. While I believe that realistically Coffman may be the best option to make sure this team gets off to a strong start, he would not be the best answer long term. Nate Sudfeld is the biggest question mark here. Everyone that watches him sees his talent, and understands the potential that lies within his throwing arm. However, heading into year three of the Kevin Wilson era, it would be tough to pass up two more experienced passers, who are quite talented in their own right. The biggest worry with not playing Sudfeld this year is that he could transfer and leave a gaping hole at the quarterback position. 1. What are the expectations for Indiana football heading into 2013? For the first time in many years there are some relatively lofty expectations surrounding the Indiana football program entering the season. While no one realistically expects this Hoosier squad to compete for a Big Ten title, the idea that they should be playing in a bowl game is rather realistic. While the non-conference schedule is far from a cakewalk, all four games are winnable, and realistically three of them are “should-wins” with games against Bowling Green and Indiana State being must wins. While the conference road slate is a relative who’s who in the Big Ten, which allows for the lesser foes to travel to Bloomington. I am a believer that as a team looking to rise up it is always a benefit to having your easier conference games at home, allowing for a better chance of victory. Sure you might not score an upset during the season, but that finally record will look a whole lot prettier. I think that Hoosier fans need to be realistic when it comes to this Indiana team. While it is always fun to predict success, getting ahead of oneself is an easy thing to do. Remember that this is a team who has made just one bowl appearance since 1993 and just nine overall. A program that has captured just two Big Ten titles, with the last dating back to 1967. Going 6-6 and heading to the Heart of Texas Bowl might not sound very glamorous, but for a team with the type of history on the gridiron that Indiana has, it is not all that bad. Don’t forget that just two years ago the Hoosiers finished 1-11!